The ING New York City Marathon is arguably the biggest marathon in the world. Thousands of runners apply to run 26.2 miles through the streets of New York City in this annual event. There are multiple ways to enter the marathon, but the most preferred method is referred to as the 9+1. The 9+1 refers to running nine races over the course of a year that are approved by the New York Road Runners and volunteering to help out at one race as well. Once a member of the Road Runners completes the nine races and helps out at one, they are automatically entered into the following year’s race. My first foray into the 9+1 was the Brooklyn Half Marathon. By completing it, I was one less race needed to complete to run in the 2012 marathon. 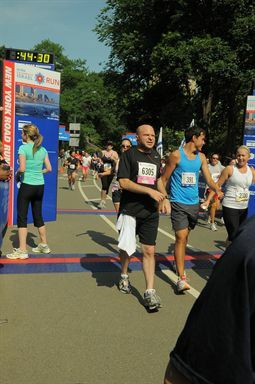 This past Sunday, I ran the four mile UJA Run for Israel in New York’s Central Park to complete my second race. Having never run in Central Park before, I hadn’t realized how steep an incline it would be. I persevered and completed the race in 37 minutes and 49 seconds. I am now two steps into the ten required for automatic entry into the 2012 marathon. Although there are other ways to enter, like joining a charity team or entering a lottery for an entry, I want to push myself to do the races this year as a goal for next year’s entry, regardless of how many other and whatever other races I run this year.